Possibly related, I noticed a jump in comments recently on my Idyllwild CHFIL video which had slowed down since I posted it a week ago, so I checked the 'realtime' views analytics on Youtube. This relatively new analytic shows up to the moment views, which had a significant spike (500 views in the last 2 hours). I thought it might've been because someone shared it on FB or something. Maybe people went to search out video of a CHFIL performance from whatever initiated the Spotify jump? I wonder if other videos of CHFIL experienced something similar? Together these videos account for 70.5 million views on Youtube. 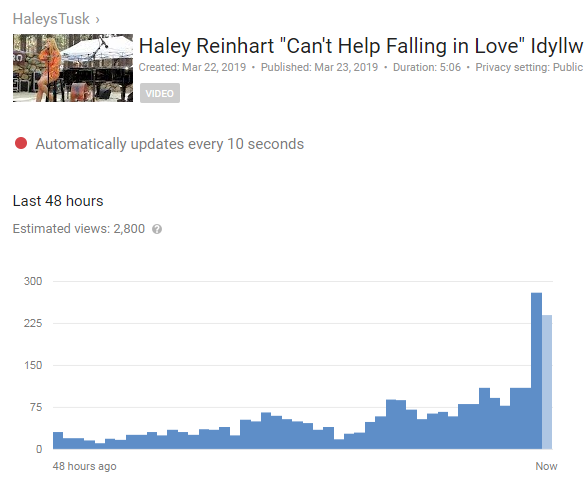 The song is also posted on Haley's channel where it has almost 275,000 views. Gain of 9486239 views. That is about 71K views per day. The "lyrics version" gets more than 60K of these views per day, making it the most popular of her YT videos. 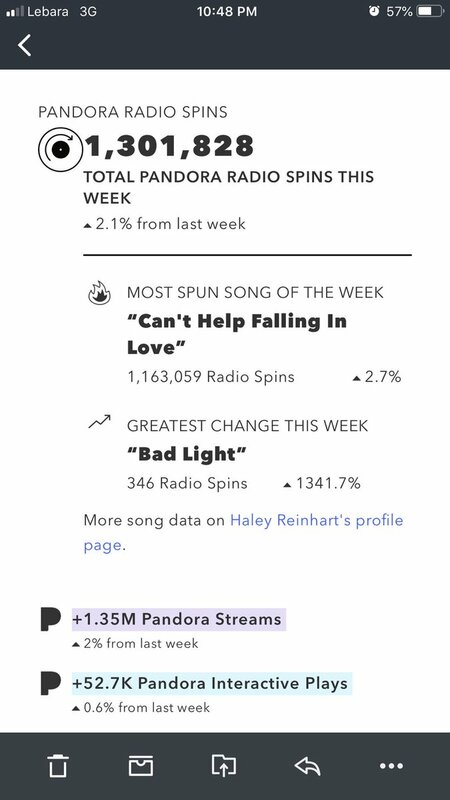 What interests me in this data snapshot is the fact that CHFIL got over 1 million plays in this one week period on Pandora. Put that together with Spotify and I assume a good number on Apple Music, and this song is putting up big numbers of views. I hope Haley sees a large chunk of the payouts, which are significant for this level of plays. Of course, a percentage comes off the top for those who hold the copyright. Some of the rates may be less because the listed rates might be for premium subscribers. (03-30-2019, 10:30 PM)john Wrote: Song has 153,793,109 streams on Spotify tonight. That is up 3,647,747 from the update on 3/08/2019 -- 22 days ago. So, for some reason it has been getting 165K streams per day recently. I predicted that CHFIL would go Double Platinum in 2019 and these numbers support that notion. Thoughts on Haley potential earnings from CHFIL. Given Pandora's small market share the number seems too high relative to Spotify, but perhaps it's demographics. Nonetheless I going to ignore there potential payouts. As of 2018 the 3 largest streaming services were Spotify (36% of market), Apple Music (19%), and Amazon (12%). In recent weeks Spotify streamed 165,000 per day. At $.00437 per stream that comes to $721 per day of payouts. If Apple Music streamed it 75,000 times per day in that period that would be another $551 per day. If Amazon streamed it 50,000 times per day, another $200 per day. These are wild guesses but they suggest the kind of money that CHFIL might generate. In March the top three streaming services potentially paid out $1,472 per day. That would be over $45,000 for the month. Add in others such as Pandora, Google Play, and Deezer and the figure is over 50K. Hard to say what Haley gets after composer royalties and perhaps slices that go to Ole and others, but for March she might get $5000 for every ten percent of the payout that goes her way. Current time: 04-18-2019, 08:41 PM Powered By MyBB 1.8.19, © 2002-2019 MyBB Group.